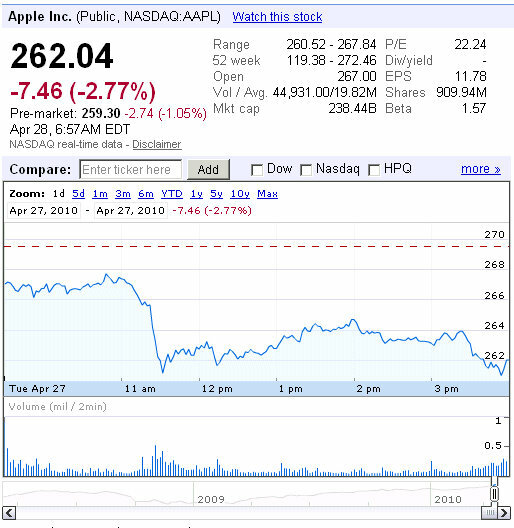 Apple was not exempt from the downward pressure placed on the overall markets yesterday as Apple stock closed (NASDAQ:AAPL) down 2.77% at 262.04 (-7.46). 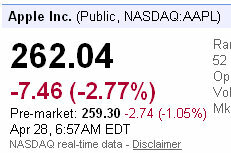 The NASDAQ index closed down yesterday 2.04% at 2,471.47. This week, starting today more than likely, Apple will begin shipping their iPad 3G units to customers who have pre-ordered the iPad 3G prior to April 19th. The new iPad 3G is expected to be even more popular than the first generation iPad – the iPad WiFi version. The increased sales from the iPad 3G, along with upcoming announcements from Apple regarding a possible iPhone 4G and other possibilities of an iPhone being released on other carriers such as Verizon, should have a continue positive impact on Apple shares.